Troy and Gabriella meet unexpectedly during their winter vacation without knowing that Gabriella is transferring to East High -- Troy's school. There, Gabriella and Troy are encouraged to audition for the new school musical, rivaling the talented siblings Sharpay and Ryan. As they overcome their fear of trying out for the play, they have the whole school challenge the status quo. 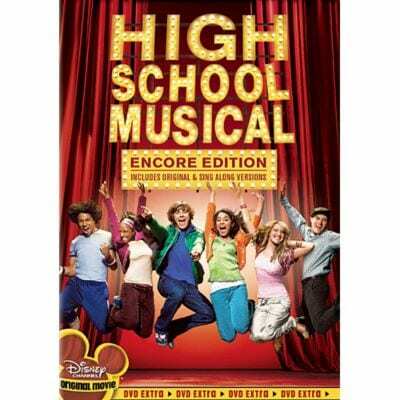 Hot Music Videos: "I Can't Take My Eyes Off Of You"; "We're All In This Together"; "Breaking Free Remix"; "We're All In This Together Remix"; "Eres Tu"
Music Video: "I Can't Take My Eyes Off Of You"
Take center stage as you and your friends perform songs from every High School Musical movie! Engage in dance-offs with your friends to the hippest tunes! Test your skills in hoops as you slam-dunk to success! All this, plus hours of out-of-your seat challenges and games that will test your High School Musical knowledge to the limit! Never-Before-Seen Music Video "I Can't Take My Eyes Off Of You"
The East High Wildcats are ready for the coolest summer jobs at the Country Club owned by Sharpay and Ryan's family. Cyrus, a shy rap artist, writes hip-hop verses only to stand idly as they're delivered to the girl of his dreams by his best friend.